This week a marble bust of the Sikh maharajah Duleep Singh by celebrated sculptor and Royal Academician John Gibson (1790-1866) will be auctioned by Bonhams. Singh was one of the nineteenth century's most intriguing personalities; the bust, showing him at the height of his fame, with pearl necklace and embroidered tunic, is expected to fetch as much as £35,000. According to The Times of India: "Punjabis have begun exploring ways to have the community hold on to [the bust]. Taking a lead is the Shiromani Gurdwara Parbhandhak Committee (SGPC), which has decided to send a representative from Amritsar, or elsewhere, to stand guard during the April 19 sale. 'The bust is our pride,' said SGPC president Avtar Singh Makkar. 'We will either send a buyer or have someone else, it could even be a company, buy it for us. We will leave no stone unturned in our effort to get such a precious thing back.'" The last Maharajah of Punjab, Singh led an eventful life that included becoming the ruler of his northwestern Indian state in 1843 at the age of five. Deposed six years later when the East India Company annexed his territories, he was placed under the tutelage of Dr. John Spencer Login and efforts to "Anglicize" him began in earnest. (Login had served as the first governor of Lahore Fort when the British annexed the Punjab in 1849.) Singh was more or less forcibly converted to Christianity in 1853; the following year, he was packed off to exile in England. He quickly became a society favorite and a familiar presence at court. Queen Victoria doted on him and became godmother to Singh's first son. (It was she who commissioned the portrait shown here, by court painter Franz Winterhalter, in 1855.) The queen appears to have been taken with him from the start. Singh is "extremely handsome and speaks English perfectly," she wrote, "and has a pretty, graceful, and dignified manner ... I always feel so much for these poor deposed Indian princes." In 1858 she noted that Singh "looks so handsome and well – and is talkative and agreeable ... Those eyes and those teeth are too beautiful.” Under tutors appointed by Prince Albert, Singh learned science, music, and German. In 1863, he left London and settled at Elveden Hall in Suffolk, where he entertained the Prince of Wales and other members of the aristocracy. Under his care the 17,000-acre estate became a well-managed game preserve that was the site of lavish hunting and shooting parties, or shikar. For the house itself, Singh hired architect John Norton to add an overlay of oriental splendor in the form of a minaret; a domed water tower; ceiling and wall panels in elaborate Indian designs; marble fireplaces; embroidered Indian wall hangings; and a set of six upholstered chairs with "peacock" backs. In the process, Singh racked up a considerable amount of debt and his pleas to the British government to return to him the personal treasures his father Maharajah Ranjit Singh had bequeathed him fell on deaf ears. Among those was the famous Koh-i-Noor diamond, which had been surrendered to Britain in the same Treaty of Lahore that had ended the younger Singh's reign in Punjab. 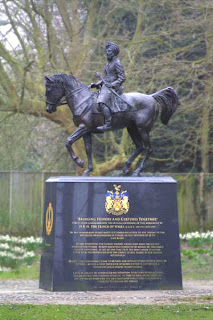 (Shown here is the statue of the maharajah in nearby Thetford, which was unveiled by Charles, Prince of Wales, in 1999). Angered by his treatment, Singh tried to return to India but was stopped in Aden and sent back to Britain. Eventually he settled in Paris in substantially reduced financial circumstances and died there in 1893. Today he lies in the yard of the Suffolk parish church he restored, next to his first wife and one of his three sons. Shown here: Singh's gravestone at the Church of St Andrew and St Patrick, Elveden, Suffolk. "Duleep Singh: Prince Charming of the Punjab"
"Sikhs want royal bust, at any cost"
Hello! You can order a print of this online from the Bridgeman Art Library. The URL is http://www.bridgeman.co.uk/. The image identification number is MFI 32281 or you can search the words "Duleep Singh." Hope this helps, and thanks for reading. I am be wrong, but l believe that l have read somewhere that this bust of Duleep singh was infact made by Queen Victoria whilst he was here in England and was not orginally from India? India was the land of priceless treasures. The British came to know of this wealth and set the East India company as a way to invade India, remove the wealth and treasures and to divide and conquer this great land and loot the priceless metals, stones, and art. Used this wealth to build Britain and the west.